Greetings again from the darkness. Director Francois Ozon won me over as a fan for life with his 2003 writing-mystery Swimming Pool. His latest stands in stark contrast to that gem, as there are no mind games for the viewer, other than those the characters play on each other. Actually, this is quite a straightforward story of romance, loss and hope; and it’s an example of expert filmmaking from a director in full control of story, setting, character and camera. It’s 1919 in historic and ancient Quedlinburg, Germany. WWI has recently ended and the loss of her soldier fiancé is still so fresh for Anna (an excellent Paula Beer) that she makes daily treks to lay flowers on the grave of Frantz. 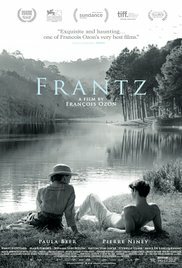 She spots an unknown foreigner paying respects to Frantz, and since it’s a small town, the two are soon enough sitting together in the parlor of Frantz’ parents’ house where Anna lives. It’s an awkward encounter between a grief-stricken German family and a Frenchman paying respects to the family of a fallen “friend”. That these folks are so quick to accept and encourage these recollections of Adrien (Pierre Niney) speaks loud and clear to human nature in times of grief – we desperately cling to any connection, positive memory, or new strand of information. Then again, Adrien’s perspective is every bit as interesting as that of the parents and Anna. He seeks forgiveness and inclusion, yet is unable to come clean on his motives and past. More human nature is on display as we initially see how the Germans treat the (outsider) Frenchman, and then later as Anna travels to France, we see how the French treat this (and presumably all) German. Anger, mistrust and deceit are ever-present amongst this group of people who seemingly only want a touch of happiness, and it’s fun to note the parallels between the initial story in Germany and the later time in France. Director Ozon flips between black & white and the periodic use of color when hope and new direction exists. It provides a personal and dramatic look to the film, along with visual clues as to what’s really occurring on screen, and is nicely complemented by the flowing score from Phillipe Rombi (Swimming Pool, Joyeux Noel). Ozon also selects one of Manet’s lesser known paintings, Le Suicide, as a link between the past and the terrific ending that reinforces the movie’s message, “life goes on”. This entry was posted on Thursday, April 20th, 2017 at 10:53 pm and is filed under Drama, World Cinema/Foreign. You can follow any responses to this entry through the RSS 2.0 feed. You can leave a response, or trackback from your own site.